So today was my first half marathon since bringing my little sproglet into the world two years ago. In fact, it was my first race since just before I fell pregnant back in 2009. And boy, did it show. However, I made it round all 13.1 miles in the blazing sunshine. I have a fetching tan-lines (damn those 3/4 length tights) and the blisters to prove it. And more than anything, I had the support of Aan amazing bunch of people who encouraged me to get out there, do it and made me feel good when I finished, even though I was much much slower than last time I ran the Bath Half. I managed to raise just under £200 for Guide Dogs but another two promised sponsorships should take me beyond my target which makes it all worthwhile. Most of the people that sponsored me wouldn't even know my blog existed so a big group thanks to them. And special thanks to my three lovely Twitter friends @KateSelwood1, @DickyBundock and @Tarb2010. All people who I've only ever met in the Twitterverse and haven't known that long, but they all generously sponsored me and kept me going with their support. Amazing people. And if you're on Twitter and don't follow them, do so now. Because they're such a funny and caring bunch. A little cheeky now and again, but they brighten every day. Anyway, having spent the day first gaining aches, pains and blisters and then the rest of it mincing around trying not to make things hurt too much, I didn't really have time for anything elaborate. Even Miss A's ministrations to get into the kitchen for some egg cracking, rolling and cutting fell on deaf ears. So I've had to settle for a dead simple recipe from Gordon Ramsay's Fast Food. It feels like one of those lazy recipes that I probably could've thought up myself if I liked honey and if I'd ever eaten Greek yogurt before. So there's a tick on my list of goodness for having tried a new recipe and a tick for having tried two new ingredients (okay I've put honey in things before, but generally if it's in it's "raw" state in a recipe, I'll always use maple syrup). I made one pot to eat after tea and another for my breakfast tomorrow. Dead simple and nice tasting, however there was far too much honey in it for my liking and I found it drowned the taste of the berries. If I did it again, I'd definitely use a spoon of maple syrup instead - a personal preference. Or maybe it would be better with different honey, but as I'm not a fan I generally buy the cheapest I can find as it only goes into hot toddies. I also used a mix of berries because normally I find blueberries quite bland but these ones for a change had a real bite to them which I'm sure much enhanced the dish. Dry toast the almonds in a frying pan, taking care not to burn. Remove and leave to cool. 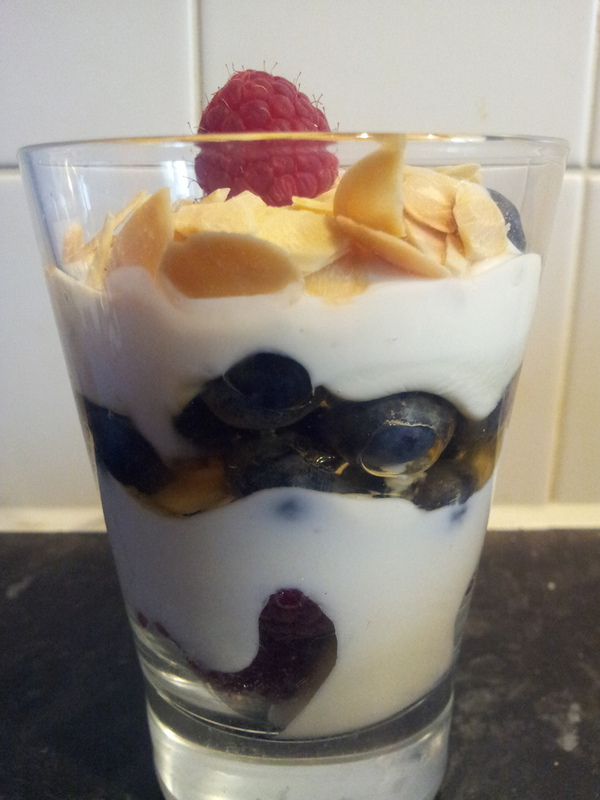 Starting with the berries, layer the berries, honey and yogurt in four individual pots. Top with the toasted almonds and serve.